10 pp. Roman, 229 pp. 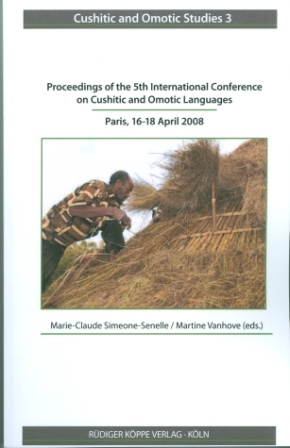 The present volume is a selection of the papers presented during the 5th International Conference on Cushitic and Omotic Languages (Paris, 16-18 April 2008). Some forty scholars gathered, coming from several African, Euro­pean and American countries: Djibouti, Ethiopia, and Sudan (where these languages are spoken), Czech Republic, Finland, France, Germany, Great Britain, Hungary, Italy, the Netherlands, Norway, Poland, Russia, Switzerland, and USA. During the five years that had elapsed since the previous conference held in Leiden in 2003, the knowledge of these languages kept increasing, with a growing interest for typologically oriented descriptions and for research dedicated to diachronic studies, including the key issue of language con­tact. The papers are grouped thematically in order to underline the consistency of the debates that took place during the meeting.